Longtime defense attorney Mickey Haller is recruited to change stripes and prosecute the high-profile retrial of a brutal child murder. After 24 years in prison, convicted killer Jason Jessup has been exonerated by new DNA evidence. Haller is convinced Jessup is guilty, and he takes the case on the condition that he gets to choose his investigator, LAPD Detective Harry Bosch. Together, Bosch and Haller set off on a case fraught with political and personal danger. Opposing them is Jessup, now out on bail, a defense attorney who excels at manipulating the media, and a runaway eyewitness reluctant to testify after so many years. With the odds and the evidence against them, Bosch and Haller must nail a sadistic killer once and for all. If Bosch is sure of anything, it is that Jason Jessup plans to kill again. –This text refers to the Hardcover edition. Michael Connelly is the bestselling author of the Harry Bosch series of novels as well as The Poet, Blood Work, Void Moon, Chasing the Dime, and the #1 New York Times bestsellers The Scarecrow and The Lincoln Lawyer. He is a former newspaper reporter who has won numerous awards for his journalism and his novels. He spends his time in California and Florida. You can’t go wrong with a Michael Connelly book. 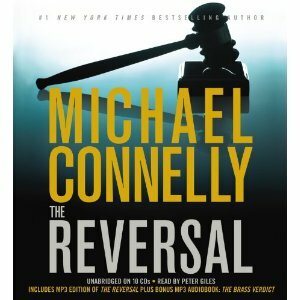 The Reversal revisits attorney Mickey Haller and creates a great mystery-thriller that will be sure to keep you up late at night. I almost cheated and went to pick up the book instead of the audio version because I wanted to read it faster than the narrator could speak. Connelly really nails Los Angeles and the star witness is a spectacular character. This is a story that will keep you guessing and wanting more. This giveaway is sponsored by Hachette Book Group and up to 3 copies of the audio book will be available. +1 Visit MichaelConnelly.com and leave me a comment with an interesting fact. My brother got me started on Harry Bosch a couple Christmases ago. This one looks good! Thanks for the chance to win. Michael Connelly is awesome and has a fantastic style. Can’t wait to read this one. I found out that Michael Connelly worked at newspapers in Daytona Beach and Fort Lauderdale, Florida – this started his interest in investigating crimes. I’ve read others by Connelly and enjoyed them – thansk for hostign the giveaway! Thanks for the giveaway. Connelly never disappoints. Thanks for having this giveaway. I have never read Michael Connelly. I’d love to win so I can finally read one of his books. It’s Christmas Eve! Be merry! I have heard great things about Michael Connelly. My mom loves his books. I have read some great reviews about Michael Connelly’s books and would love to win this audio book.